Che Guevara, Marxist terrorist well-known for anti-Zionist stance, being displayed on new Labor-Hatnua campaign poster. Labor-Hatnua raised eyebrows this week by using the image of controversial revolutionary figure Che Guevara in their latest campaign gimmick. 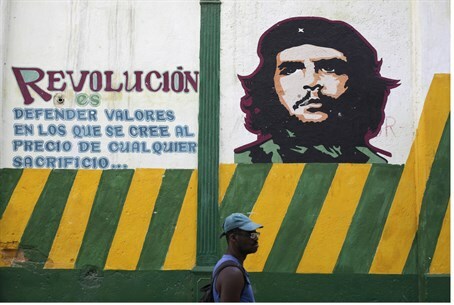 Guevara, a Marxist guerilla leader, is hailed by radical leftists worldwide as a symbol of revolution. He is best known for his role in helping overthrow the Batista regime during the Cuban Revolution between 1953 and 1959. However, Guevara also remains a reviled historical figure who took an overtly active role in the brutal violence that followed Fidel Castro's takeover of the Caribbean island, among other crimes. He participated in firing squads of those convicted as war criminals in Cuba's revolutionary trials and also supported the use of concentration camps for dissidents, homosexuals, Catholics, and Jehovah's witnesses. Additionally, Guevara was also extremely anti-Israel. He visited Gaza in 1959 to show solidarity with the Palestinians and teach them the tactics of guerilla warfare. He also supported the establishment of the PLO in 1965. Those negative aspects and Guevara's clear anti-Zionist stance didn't deter the Labor-Hatnua joint list - also known as "The Zionist Camp" - from using his iconic image in Herzliya on Sunday. At the Interdisciplinary Center, the party set up a stand featuring a cut out of Guevara's face with the words "we are the revolution" under it. Passers-by were encouraged to take pictures with their own faces in the cut out portion. The stand will be brought to other college campuses in Israel throughout the week, a party spokesman said Monday. He declined, however, to answer questions about the dark side of Guevara's persona. When asked by Reshet Bet reporter Eran Cicurel what connected Guevara to the party, Labor-Hatnua activists at IDC Herzliya responded that he represents "the spirit of revolution" and "symbolizes someone who came from the people and made a change." "We're not Marxists or something like that. We wanted something that puts the spotlight on the word 'revolution,' because we're going to bring a revolution," an activist told Cicurel. "Young people don't connect him to the Marxist Revolution. We don't want to turn the country into an anti-democratic dictatorship or something like that."